Objective In most developed countries, substantial disparities exist in access to mental health services for black and minority ethnic (BME) populations. We sought to determine perceived barriers to accessing mental health services among people from these backgrounds to inform the development of effective and culturally acceptable services to improve equity in healthcare. Design and setting Qualitative study in Southeast England. Participants 26 adults from BME backgrounds (13 men, 13 women; aged >18 years) were recruited to 2 focus groups. Participants were identified through the registers of the Black and Minority Ethnic Community Partnership centre and by visits to local community gatherings and were invited to take part by community development workers. Thematic analysis was conducted to identify key themes about perceived barriers to accessing mental health services. Results Participants identified 2 broad themes that influenced access to mental health services. First, personal and environmental factors included inability to recognise and accept mental health problems, positive impact of social networks, reluctance to discuss psychological distress and seek help among men, cultural identity, negative perception of and social stigma against mental health and financial factors. Second, factors affecting the relationship between service user and healthcare provider included the impact of long waiting times for initial assessment, language barriers, poor communication between service users and providers, inadequate recognition or response to mental health needs, imbalance of power and authority between service users and providers, cultural naivety, insensitivity and discrimination towards the needs of BME service users and lack of awareness of different services among service users and providers. Conclusions People from BME backgrounds require considerable mental health literacy and practical support to raise awareness of mental health conditions and combat stigma. There is a need for improving information about services and access pathways. Healthcare providers need relevant training and support in developing effective communication strategies to deliver individually tailored and culturally sensitive care. Improved engagement with people from BME backgrounds in the development and delivery of culturally appropriate mental health services could facilitate better understanding of mental health conditions and improve access. Considering that people from ethnic minorities are more likely to have poorer health outcomes and find it difficult to access healthcare than the majority population, this qualitative study provides comprehensive information about perceived barriers to accessing mental health services. The in-depth focus group discussions were guided by a topic guide and ascertained various aspects of access to mental health services; including type of service(s) used, issues with, and experience of using the service, perceived barriers to accessing the service and how the services can be improved. Owing to the inclusion of a specific sample of participants and the quality of dialogue and analysis, the study achieved a sufficient level of information power. Considering the diverse black and minority ethnic (BME) population, our participants (majority were university educated) represented a subsection of this population; therefore, they may not represent the views/perceptions of all strata of the BME population. The prevalence of common mental disorders varies markedly in different BME communities. For example, there is relatively higher prevalence of anxiety and depression in south Asian women (63.5% compared with 28.5% of white women),6 ,7 and psychotic disorders in Afro-Caribbean men (3.1% compared with 0.2% of white men).7 There is also wide variation in the pathways and pattern of use of mental health services.8 ,9 In general, people from ethnic minorities are less likely than their White British counterparts to have contacted their general practitioner (GP) about mental health issues in the last year, to be prescribed antidepressants or referred to specialist mental health services. It is not clear whether disparities in access to mental health services reflect variation in actual BME mental health needs or are the product of institutional, cultural and/or socioeconomic exclusion factors, which disadvantage those from a BME background.10 ,11 There is some evidence that hard-to-reach groups, including BME, are less likely to obtain appropriate mental healthcare4 ,12 and may be disadvantaged either because they are unable to access services or because they receive inadequate help from services.13 Factors considered important barriers to accessing services include cultural competence (ie, the ability of providers and organisations to effectively deliver healthcare services that meet the social, cultural and linguistic needs of patients);11 ,13 variation in clinical practice and service provision;9 cultural models of illness; stigma;4 ,14 ,15 fear;16 perceived discrimination and barriers to communication.4 ,17 However, few studies have explicitly examined the perspective of individuals from the BME community on the barriers to accessing mental health services. Although most mental health services are based and delivered in a community setting, little research has been conducted to understand the barriers faced by BME communities to access the appropriate service. Perceptions of barriers to access can provide valuable evidence that may help to shape and drive changes within mental health services. We conducted a qualitative study to understand such perceptions among BME individuals in Southeast England to inform the development and commissioning of effective and culturally acceptable services. BME individuals, aged 18+ years, resident in the city of Brighton and Hove were eligible to participate in the study. Participants were identified through the registers of the BME Community Partnership (BMECP) centre and by visiting local community gatherings and were invited to take part in the study by the community development workers. BMECP is a registered charity that works with BME community groups, organisations and individuals in Brighton and Hove.18 The participants were given an anonymous self-administrated questionnaire to complete and were requested to deposit it in a ballot box. The questionnaire included information on gender, age (in age groups), level of education, ethnicity (according to the Office of National Statistics classification), marital status, duration of residence in Brighton and Hove and sexuality. The study was based on two focus group discussions (each lasting for about 2 hours) and included 26 participants from the Asian/Asian British (n=4), Black/Black British (n=6) and mixed (n=3) communities; 13 participants did not respond to the question on ethnicity. Eleven participants were aged 18–34, 10 were aged 35–64 and 2 were aged 65+ years (3 participants did not report their age). Focus group 1 included 14 participants (FG1, 9 females and 5 males) and 12 in focus group 2 (FG2, 4 females and 8 males). The majority of participants had a university qualification (74%) and were resident in the area for more than 2 years (83%). The study was commissioned under the Department of Health “Delivering Race Equality in Mental Healthcare” programme, and the protocol and focus group topic/discussion guide of the study were reviewed and approved by the Public Health Directorate National Health Service (NHS) Brighton & Hove, Sussex Partnership NHS Foundation Trust and BMECP. The focus groups were conducted in June 2010 at the BMECP Centre. Light refreshments were provided, and a £25 supermarket voucher was given as an honorarium to each participant. The objectives of the study were explained to the participants, and informed consent was obtained. Each participant completed a self-administered demographic questionnaire. Discussions were facilitated by a researcher trained and experienced in cross cultural working and qualitative methods (LMM). Each session was audio-recorded and transcribed verbatim. In addition to the recording of the discussion, written notes were also taken, using flipcharts, to allow for a review of the process and to ensure that participants' views were clearly documented. Each participant was encouraged to speak and express their own views and often conversations among participants enriched the discussion. A topic/discussion guide with questions developed by the Mental Health/Wellbeing Needs Assessment Group (lead by AM) was used to ascertain various aspects of access to mental health services; including type of service(s) used, issues with, and experience of using the service, perceived barriers to accessing the service and how the services can be improved. Broad topic guide questions included: (1) Tell me about what mental health/well-being means to you? How can someone maintain good mental health? (2) How can someone who is experiencing worry or difficult emotions or thoughts deal with them, or find help to deal with them? (3) What are some of the things that might prevent someone who feels like they need help to deal with worry or difficult emotions or thoughts, but are unable to get it? How might this be different for men and women? (4) How can the current mental health/well-being services provided be improved? Thematic analysis was conducted to identify key themes that commonly emerged regarding the perceived barriers to accessing mental health services.19 Two researchers familiarised themselves with the scripts and notes and developed an iterative coding scheme using NVivo qualitative data analysis software. This process involved the identification of common words and phrases which were coded and later grouped into subthemes and themes. Following identification of key themes, the transcripts were coded according to theme. As the data were reviewed, new themes and subthemes emerged and were adapted in an iterative process. To minimise bias, another researcher independently read the scripts and coded and analysed the data to enhance the validity of the emerging themes. Anonymised quotes from the participants were used to illustrate the themes identified in the study. 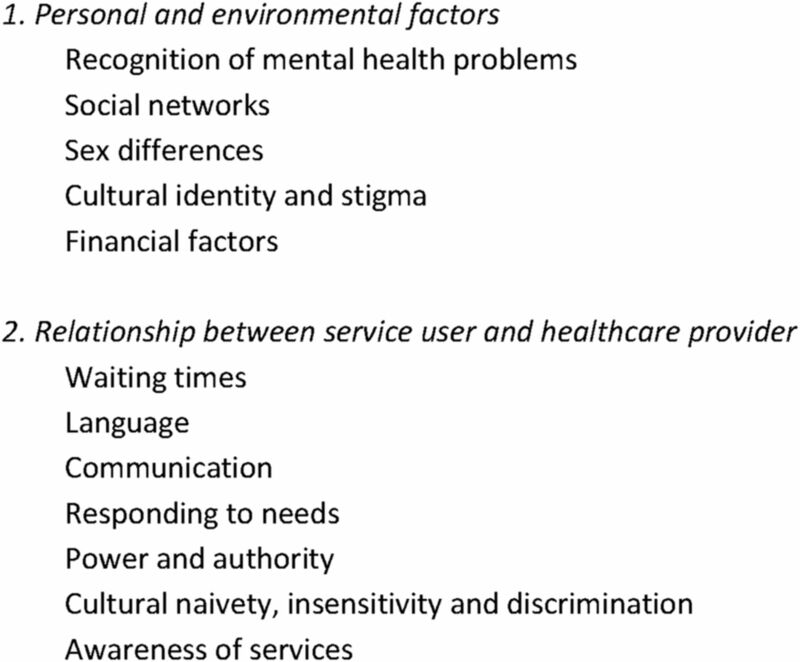 The study identified two broad inter-related themes as barriers to accessing mental health services: (1) personal and environmental factors, and (2) relationship between service user and healthcare provider. Each theme was comprised of subthemes (figure 1). Perceived barriers to accessing mental health services among the BME communities. BME, black and minority ethnic. Several personal and environmental factors were recognised as affecting access to mental health services. Five subthemes were identified as potential barriers, each is described below. Inability to recognise symptoms of mental illness and unwillingness to accept a diagnosis of mental illness were mentioned as key barriers to seeking help from health services, particularly for individuals who had grown up in their native countries. For instance, one woman stated that in Africa she “never heard of mental health or being depressed” (Female L. FG1). This was compounded by a cultural belief that mental health was sometimes not to be discussed openly with family members. As a result, health seeking for psychological problems was reported to be delayed and to lead to presentation as a crisis or emergency because people “hide it, until last minute when it is very bad” (Male J. FG2). A network of family and friends within the community was seen as key in providing a safe framework for the discussion of problems and could play a valuable role in accessing mental health services, particularly in crisis: “There were so many gaps in the services. My mum was seeing them all the time. She was having to do so much just to get him assessed” (Male J. FG1). However, social networks could also be perceived as a barrier either through their absence, or by providing an alternative to professional services. One woman highlighted that a lot of people who grew up in their native country may not have family or social connections in the UK and “the mental health service does not always understand. That we are really, really isolated” (Female I. FG1). Social isolation was also relevant for people who lived alone, or whose family structure had broken down: “if your family structure breaks down you find yourself so incredibly isolated. It is then that you might realise that, it is not to do with intelligence or anything, it is just like, where to go to find help is really hard […]” (Female H. FG1). Informal social support structures could be perceived as a viable alternative to accessing professional mental health services, particularly where there was an element of distrust within the community towards formal healthcare provision: “In the West Indian community […] people do not trust psychiatrists particularly […] in terms of where my family and friends would turn in experiences of bad mental health or whatever is towards family structures. Informal structures, friends.” (Male D. FG1). Many participants suggested that BME men were less willing or less able to talk about their problems, particularly with mental health professionals: “Men, we tend to keep things to ourselves. We do not think that by exposing our own insides to outside will bring any solution at all […] I am a man, I can sort it out” (Male B. FG2). Participants also perceived services were not “available for men of colour who have mental health issues” (Male J. FG1). Although a large number of male participants emphasised the importance of discussing concerns, the ability to deal with problems was often described in terms associated with a wider masculine identity, for example, ‘pride’ (Male B. FG2) and strength. Significant emphasis was placed on cultural identity and stigma towards mental health as barriers to accessing services. Participants commented on how cultural background and identity defined acceptable responses to mental health problems and appropriate coping mechanisms. One woman described the attitude within her community where individuals were expected to “deal with it…you are supposed to be strong. You are from Africa” (Female L. FG1). Mental health was often perceived as a socially unacceptable topic for discussion: “Stuff like that is never talked about” (Female L. FG1). Mental illness was also typically viewed negatively, or in the context of extreme cases the services were seen as serving “crazy people only” (Male L. FG2). Owing to the stigma towards mental illness within the community, individuals were reluctant to openly acknowledge symptoms, thus restricting access to the services. One participant explained that “our people cannot go to mental health services because […] he thinks it is only crazy people going there” (Male L. FG2). In addition, the participants explained that people might also be reluctant to seek help on behalf of another member of their community due to social stigma: “if you tell those in authority, ‘Please my friend has a mental health problem and I am worried’, then what will happen? I am from Sudan. My community will come to me and say, ‘Why are you doing this to him?’ because in our culture, in our country, it is wrong” (Male J. FG2). The consequences of cultural stigma attached to mental health were recognised as reaching beyond the individual. One participant described how a mental health diagnosis could stigmatise the whole family, affecting employment prospects and standing in the community: “in our country if you hear about somebody in this family sick, is mental, you lose trust in this person and whole family, maybe relative as well. And, […] they whisper about the whole family and maybe talk about grandmother, grandfather, and they lose respect” (Male J. FG2). The cost of using complementary medicine or therapy, which is not covered under the NHS, for example, relationship counselling “‘Relate’ costs you money” (Male U. FG2), was seen as a barrier to accessing the services: “If you want the alternatives you have to physically go and find them and you have to pay” (Female F. FG1). Most participants reported that they were unable to pay for these therapies and this often meant their illness would remain untreated: “There is no money. We just cannot afford it […]. You just have to do it yourself. Then you end up just leaving it” (Male B. FG2). A number of participants believed that community support groups and organisations are important in providing an informal structure for activities, discussion and support; but that a lack of funding for the associated costs of running these groups was an issue “We cannot afford it (to hire a hall for community meetings). You can apply for council funding but you have to have this and that”. (Male Q, FG2). Several components of the relationship between service user and healthcare provider were recognised as affecting assess to mental health services. Seven subthemes were identified as potential barriers, each is described below. Several participants highlighted long waiting times as a barrier to accessing services and expressed frustration that services were unable to respond quickly to mental illness: “He has now been 6 months on the waiting list—my friend's son. He died about 2 weeks ago. […] There is such a long waiting list, and why have they not got sufficient people to address these…? This is our future, these young men” (Female C. FG1). Lengthy waiting times for assessments and services were identified as negatively impacting on the outcome for individuals by allowing a mental health problem to escalate in severity: “she was told there was a four month waiting list before she could get any support. […] her state went from being one in which she was quite open to getting help to one where […] basically her situation declined significantly […]” (Male D. FG1). Language was seen as a common barrier to access. Participants emphasised that some people within the BME community had little or no understanding of English, especially if they were recent immigrants. The inability to effectively communicate with healthcare professionals prevented individuals from accurately articulating their problems: “They do not know how to explain their problems. That is why they do not want to go to GP many times. So they remain with their illness. That is our big problem” (Male H. FG2). As a consequence, an individual might experience additional stress, withdraw from healthcare services or receive inappropriate investigation and treatment: “I know one person, he has struggled and struggled. He said what he could say but the limit of the words, the real words he wanted to say to the GP, he did not know the meaning of them in English. Then in the end they end up getting the wrong treatment” (Male B. FG2). Although one participant noted that interpreting services were better provided for in recent years, concerns were still raised over inadequate provision of interpreters, particularly in primary care “the interpreter service does not send to the GP because of the ten minute time” (Male L. FG2). Poor communication between service user and healthcare provider was indicated as a key barrier to developing an effective relationship. Failure in communication arose not only from the linguistic challenges described above, but from doctors' perceived inability to listen to the concerns and needs of service users. Participants felt that healthcare providers took a generalised approach and failed to listen to individual needs: “you treat everybody with the same brush […] you go in and […] you are just like the next person. They do not take time to listen to you. And I do not think it is because of colour or anything like that. In talking to a lot of people, including White people, they encounter the same thing …” (Female F. FG1). A further challenging area of communication lay in the reluctance of professionals to engage with friends and relatives attempting to access mental health services on behalf of an individual with mental health problems: “I think getting services to respond when a parent is telling them needs to happen more […] Listen to the family telling them that this person has got a problem. There might be reasons why they have not gone to the services” (Male J. FG1). It was often felt that healthcare providers “just did not want to get involved and give him the help that he needed” (Male J. FG1) and, despite evidence of escalating problems, concerns were dismissed: “She had to fight to get him assessed and they were telling her ‘no, there is nothing wrong […] From the first time he was sectioned after an overdose. They were not there—they did not help her […]” (Male J. FG1). Participants felt that healthcare providers did not adequately recognise or respond to their needs. They felt that the system lacked flexibility, leaving it unable to support individual or cultural preferences, particularly in relation to available therapies. One participant described the general response to symptoms of depression as “just fill this form in and say how your mood is and I will give you some antidepressants” (Female L. FG1). Many participants described receiving “pills that I do not want” (Female L. FG1) and felt their reluctance to start medications was disregarded, and that the use of complimentary/alternative therapies was not explored. One participant explained “for me it really felt like they were wasting my time. He did not give me any help whatsoever” (Male B. FG2). Many participants wanted “to access people who will listen to us, who will allow us to talk” (Female C. FG1) and raised concerns that talking therapies were not readily provided, and organisations offering creative approaches such as expressive writing workshops were not encouraged. One participant described the experiences of his friend: “she had the choice between medication and down the line when her situation declined then you have got the opportunity to be sectioned, which is not really an opportunity” (Male D. FG1). Participants felt that if healthcare professionals “widened their cultural knowledge of what was normal” (Male K. FG1), it would allow them to consider a greater range of therapies and supportive techniques. Interactions with clinicians were described in terms of “being talked down to” (Male D. FG1). There was concern that clinicians had “the power simply with the stroke of a pen to decide whether you are going to be sectioned or whether you are going to be sent away for some counselling. Or […] administered some really, really high doses of whatever kind of medicine” (Male D. FG1). It was felt that there was “a clash between the professional expertise that the doctor has and is often given privilege over someone's knowledge about their own mental state and mental health and experiences” (Male D. FG1). Although some participants expressed a need to “try and change that balance of power between the two of you” (Male D. FG1), they also described a sense of helplessness and passivity with regard to healthcare interactions and treatment: “We have to follow what the professional said. If we do not want to follow what they are saying, it is our problem […]” (Female N. FG1). A worsening of the service user and healthcare provider relationship and exclusion from services were seen as possible consequences of assertive behaviour: “I asked for a change of CPN [community psychiatric nurse] and they crossed me off […] She was not able to give me what I needed. […] I got made an appointment to see a psychiatrist and the psychiatrist said that we can no longer offer you any services or help” (Male M. FG1). The need for a positive interpersonal connection between service user and healthcare provider where the consultation was “a dialogue” (Male D. FG1) was seen as an important factor in engaging with mental health services. Participants described how healthcare providers often struggled to understand BME people's experiences. A few participants expressed annoyance at having to explain “the Black experience” (Female I. FG1) to healthcare professionals feeling that this interfered with effective therapy. One woman described “humouring the therapist so that they can actually give me the help that I really need. And I have also found that when you, for instance, talk about racism that actually a lot of them cannot deal with it” (Female I. FG1). When accessing services, many participants wanted “to see someone like me, someone who understands my culture who […] is going to welcome me with open arms and is going to get what I am saying” (Female E. FG1). Participants perceived that White British GPs and specialists were unable to understand or sympathise with the realities and experiences of those from a BME background. Services were often seen as insensitive to the needs of Caucasian service users, and they were often categorised: “They do not want to be aware of what we are trying to say. So, they just put in a category. Just White British way” (Female G. FG1). Some participants felt they had received inadequate or different treatment “because of our skin or where we have come from” (Male B. FG2). One participant expressed her frustration over her experiences in accessing treatment: “I got an English friend and she said to me that she has got the same problem […] her GP transferred her to her consultant to see her problem and her problem was solved. Why would my GP not transfer me to a consultant instead of giving me a different tablet every time? I just feel like I am really angry and really frustrated because they transferred her because she is English and I am not English” (Female E. FG2). General lack of awareness—among healthcare professionals and the wider community—of the services available within mental healthcare and how to effectively access them was another barrier. Participants felt they did not know “how we get help” (Male G. FG2). One woman illustrated: “If we don't know that something is available, how are we going to access it?” (Female F. FG1). Participants wanted to be informed of available services for further help and support, but felt GPs “need to be aware of community organisations, because they are not” (Female E. FG1). There was a sense of frustration that “when we access the doctors if they do not know that there are these kind of groups we can turn to, then it is a futile exercise” (Female F. FG1). Lacking wider knowledge of organisations available to provide mental health support meant GPs could not discuss the full range of treatment options available and were unable to signpost service users to appropriate services: “If they are not equipped to deal with us I would rather they sent us to a support group” (Female E. FG1). One participant expressed how this lack of awareness of alternative therapy could contribute to the apparent unresponsiveness to service users' needs (described above): “The NHS […] needs to be educated to the point that they know that there are other avenues that they can turn to if they are not working for that individual person” (Female F. FG1). The prominent role of social networks identified in our study was consistent with previous research,23 ,24 in particular the preference of family and friends as a source of help for common mental health problems, rather than healthcare professionals. Participants recognised social networks as a source of support, enabling discussion of problems and access to services. Research has shown that members of the BME community often find it more appropriate to talk within their social network rather than to a professional, with formal mental health services perceived as a last resort.17 ,27 The possibility of the social network acting as a barrier or alternative to professional mental health services is supported by qualitative studies which suggest individuals from a BME background are less likely to contact their GP about mental health issues.28 In part this may be due to a lack of trust of mental health services which would encourage people to use their friends and family first. We found that men in particular were a hard-to-reach group and were more reluctant to seek help and felt excluded from mental health services. In previous studies, men were less likely than women to have sought help for common mental health problems, and more likely to have a negative attitude towards help seeking behaviour.27 ,29 Men ascribed particular importance to self-reliance in managing mental health issues,27 a perspective that was supported by the findings of our study. The relationship between service user and healthcare provider was recognised as pivotal to participants' overall experience of accessing services—communication and the ability to respond to service user needs were demonstrated to be important factors. Communication is central to the service user and healthcare provider relationship, and a positive relationship with a healthcare professional is likely to encourage disclosure with better healthcare outcomes in terms of diagnosis and treatment.30 ,31 It is well known that poor communication and interaction between service user and provider plays a key role in encouraging or dissuading future health seeking behaviours.13 Fear, in particular, was raised as a cause of a poor relationship—healthcare professionals were often perceived to have significant power and authority over service users, and as participants highlighted in this study, other research has shown that this power could present a difficulty if service users or families challenged a professional decision. The UK BME population is a highly diverse entity, and our participants represented a subsection of this population. Also, the majority of our participants were university educated and therefore may not represent the views/perceptions of all strata of the BME population. Some of the previous studies have identified differences among specific ethnic minority group(s) with regard to perception of illness and stigma.33 Our study was focused on BME population in general and, unlike some recent studies, was not focused on any particular ethnic or service-user subgroup. The objective was to understand the barriers and community perspectives that could be applicable to the majority of different ethnic groups in the UK. Furthermore, we were unable to conduct a comprehensive analysis of ethnicity-specific barriers to accessing services as half of our participants did not respond to the question on ethnicity. This may highlight possible discontent with the recommended ethnic group categories/question. On the other hand, we did examine differences in perception of barriers to accessing mental health services by gender. Like qualitative studies in similar settings, it is also possible that the results could be affected by selection bias; for example, if the study included participants who were particularly keen to discuss their views and perceptions and/or participants who have had negative experience of accessing/using mental health services and therefore wanted to share these experiences. Considering the aim of the study, inclusion of a specific sample of participants and the quality of dialogue and analysis, we believe the study achieved a sufficient level of information power. Although our data were collected a few years ago (the study was commissioned under the Department of Health “Delivering Race Equality in Mental Healthcare” programme), we believe that the findings are still very much relevant to inform the development, commissioning and delivery of effective and culturally acceptable mental health service and to improve access to the service. The study not only identified key barriers that are relevant to BME population, but also barriers likely to be shared with other minority or marginalised groups. Our study was based in the community setting and addressed the BME population as a unified group and, as stated above, was not focused on a particular ethnic or service-user subgroup. The large majority of recent studies have been based on a particular stratum of the BME population, focusing on either a specific issue or service-user subgroup. In contrast, our study provides comprehensive, practical and systematic discussion on the subject and is focused on the BME population as a whole—the narratives and perspectives expressed reflect perceptions of barriers to accessing mental health services that are currently important considerations for improving equity in healthcare and reducing health inequalities. Our findings also add to the on-going discussions in the Department of Health and Public Health England to develop the next stage of efforts to promote mental well-being among the BME populations and address racial/ethnic inequality throughout the mental health system. We believe the findings of our study would be relevant and inform the development of such efforts and the mental health strategy. Perspectives of BME service users on barriers to accessing mental health services have the potential to translate into tangible direction and framework for future equitable service delivery and healthcare professional practice. It is important to focus on tackling barriers at the personal and environmental level and on removing barriers encountered at the interface between service user and healthcare provider. These include raising awareness of mental health and reducing stigma; raising awareness of services and access pathways; expanding and enhancing the role of BME staff within mental health services and developing cultural awareness and sensitivity. BME service users need to be better informed to become enabled and empowered to engage with their own mental health and well-being and with services. Raising awareness of mental health can reduce stigma and help individuals to recognise symptoms; this may encourage health seeking behaviour at an earlier stage of presentation. Antistigma programmes, such as the national Time to Change campaign,34 may significantly reduce discrimination and raise awareness.35 Delivering this work at a local level and raising awareness of the locally available services and the variety of pathways to accessing care is important to educate and empower individuals and communities. Commissioners of mental health services, local authorities, healthcare services and community groups need to play a role in collating and disseminating such information and in accessible languages where relevant. Concerns raised in this study regarding waiting times for mental health services may in part be addressed by the government's introduction of the first waiting time targets for psychiatric services, including talking therapy. Healthcare providers may need formal training to further their understanding of the cultural issues and differences, and the sensitive and diverse needs of the service users. Participants in the study expressed a wish to see a service provider from the same BME background as themselves because they would be more likely to understand their situation and experiences. Research on ethnic concordance between service users and providers have found that people with a BME background who have experienced racial discrimination in healthcare have a preference for ethnic similarity in their healthcare providers and that ethnic and language matching promote clinical judgments of more severe psychopathology.36 ,37 Strategies aimed at expanding and enhancing the role of BME staff within mental health services may help deliver more culturally sensitive interactions and services. Building trust between individuals, communities and mental health services is a particularly important factor and is well recognised within government policy.5 Approaches could include reverse commissioning (an initiative supported by the NHS BME Network which seeks to enable the commissioning of services that meet BME needs and reduce inequalities)38 and using patient and public involvement groups and BME needs assessments to identify gaps in service provision and highlight potential new and culturally appropriate interventions. The authors thank Martin Campbell at NHS Brighton & Hove; Andy Porter, Andrew Dale and Eleanor Hope at Sussex Partnership NHS Foundation Trust; Peter Koroma and Doris Ndebele at BME Community Partnership and Dr Victoria Collins at Brighton and Sussex Medical School for their help and support in conducting the study. National Institute for Mental Health in England. Inside outside: improving mental health services for black and minority ethnic communities in England. London: National Institute for Mental Health in England, 2003. The Sainsbury Centre for Mental Health. Breaking the circles of fear. A review of the relationship between mental health services and African and Caribbean communities. London: The Sainsbury Centre for Mental Health, 2002. Department of Health. Delivering race equality in mental health care: an action plan for reform inside and outside services and the government's response to the Independent inquiry into the death of David Bennett. London: Department of Health, 2005. Department of Health, HM Government. No health without mental health. A cross-government mental health outcomes strategy for people of all ages. London: Department of Health, 2011.
. Adult psychiatric morbidity in England—2007, results of a household survey. In: McManus S, Meltzer H, Brugha T, et al., eds. The NHS Information Centre for health and social care, London, 2009. MIND. Mental health crisis care: commissioning excellence for Black and minority ethnic groups. London: MIND, 2013. Contributors AM conceived and designed the study and developed the questionnaires; AM and KT wrote the first draft of the manuscript; LMM implemented the focus groups; KT, LMM, VC and AM coded and analysed the data; KT and JS contributed to the literature search and prepared the drafts of the manuscript; MC, TS and RdeV contributed to the interpretation of the results and commented on the draft manuscripts. All authors reviewed and approved the final manuscript. Data sharing statement Selected qualitative data from the BME focus groups could be made available on request.